It was early Sunday afternoon and Chevolution (Red Envelope Entertainment) fit the mood. 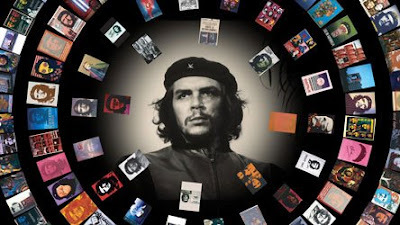 Directed by Luis Lopez and Trisha Ziff, the documentary explores who is Che Guevera and the reason behind the fame of his image. The film asks rather interesting questions about how a photograph of the revolutionary and a close ally of Fidel Castro could become the selling tool of such diversified capitalist goods from beer to bikinis. This film effectively shows how co-option of a symbol, in this case a photograph, can dilute its intended purpose. One very well-presented cautionary tale of what happens when one does not protect his/her intellectual property be they revolutionaries or capitalist, this film should not be missed. Then it was time to move on to something that offered something a little more light-hearted: the latest creation from the living legend Melvin Van Peebles. Confessionsofa Ex-Doofus-ItchyFooted Mutha (Yeah Incorporated Productions) is an amusing yarn is about a boy from Chicago who wants to see the world and get rich but discovers that all he needs is the love of a good woman. Based on Van Peebles' 1982 Broadway show Waltz of the Stork, Confessions chronicles the adventures of a man who, armed only with a can of contingency cash, swims his way to New York, joins the merchant marine, romances women of all ages, and dances for his life. That Van Peebles, at 75, plays the title character from boyhood to age 47 only adds to the playful inconsistency of this saga. Van Peebles uses digital media not as a substitute for film, but as a brand-new toy, effectively exploiting HD cam, animation, stock footage, wipes, multi-exposures, split screens, and every other effect in the basic digital book. Well, after taking off a few days from the festival we came back with some thoughts, questions and further reviews. There were a few films that address African-American issues such as Mariah Carey's Tennessee, and the profound documentary Faubourg Treme: The Untold Story of Black New Orleans, to mention a few. But what seems missing at Tribeca a sense of lack cohesion when it comes to African-American films. But, back to the reviews. May 1, and it's Movement for Workers and Immigrants Rights Day and if we had forgotten, the massive rally in Union Square one block away from the film's press office was a dramatic reminder. In tune with the mindset of the day, we headed off to Celia The Queen, a profound documentary about the life of the Queen Of Salsa--Celia Cruz. The documentary was listed in three categories at Tribeca: political, Latin, and "women" films, which speaks loudly to the impact the Cuban refugee has had on the world. The film is an engaging recapturing of Celia story and how she used her music to force down the barriers of racism and sexism. Not wanting to miss the 2008 winner of the Tribeca documentary award, we scurried to the press-screening library. Directed by Gini Reticker, Pray The Devil Back To Hell (Fork Films Production) is a film about the Liberian women's movement and how they used non-violence to bring positive change to Liberia when it was on the verge of total chaos in 2003. The film effectively documents how thousands of women, Muslims, and Christian came together with resolve to end the bloodshed that was tearing their country apart and without malice forced a peace accord in the country's civil will and culminated with the election of the first democratically elected woman president in Africa. Can we say Woman Power?! Another African film we screened was War Child (18th St. Films), a poignant, profound and enlightened 93 minutes of film directed by C. Karim Chrobog. The m ovie manages to keep the human condition and the complexity of life on stage every second. 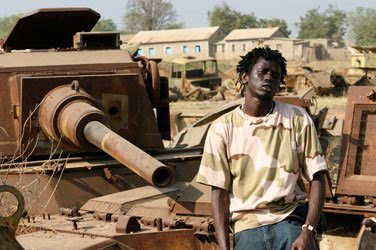 War Child focuses on rising hip-hop artist Emmanuel Jai and his journey from child solider in Sudan (as in Darfur) to the international stage. Emmanuel is from the time we meet him at about age 10 an articulate, smart and savvy kid and just listening to him one would think he's just your average child holding his best friends hand and playing games, but then reality slaps the viewer right in the face. This seven- year-old is a solider with a gun and will kill to survive--one of 10,000 child solider in Sudan's civil war. It all seemed profound that a child who grew up in such complex circumstance would then becomethough his music the voice for a those who endured the pains of Sudan's civil war. He's using hip hop to bring attention to the bright of Darfur; he's using music to build schools; Jai is using music and his tumultuous past to bring hope. War Child seems to have come at the right time, it seems to remind one that things aren't ever hopeless, just as long as you believe and are willing to fight for that belief. Between all the screenings, celeb sightings, and NYC happenings there was actually business being done. A number of films, especially the documentaries, found buyers. Among the flicks that landed deals were: Cocaine Cowboys 2: Hustlin' With the Godmother and Bigger, Stronger, Faster, which were both bought from Magnolia Pictures by NonStop Entertainnment. Meanwhile, Magnolia Pictures picked up North American rights to writer-director Peter Tolan's Finding Amanda, starring Matthew Broderick. Hammer Films and Spitfire Pictures has acquired remake rights to a Swedish flick called Lat den ratte komma in.